Carles Manera holds PhDs in History and Economics. A professor in Economic History, he has authored six books and 130 papers. He has been a scientific director for research projects and has guest lectured at various institutions, including the London School of Economics. He has also been a university Vice-Rector and government minister. This book analyses the major economic crisis that began in 2007–8 and continues in 2013. Carles Manera explains that it is not just a financial crisis, caused primarily by the banking sector, as many commentators claim, but a systemic crisis caused in part by overproduction, falls in business profits, environmental problems, and a stubborn insistence by political and monetary authorities on economic policies driven by austerity. 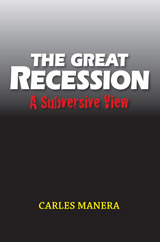 Providing examples from the economic history of western nations, which provide economists and social scientists with essential reference for understanding the complexities behind this Great Recession, the author proposes economic solutions to end the crisis that are at odds with policies proposed and acted on by major European governments, led by Germany. Manera thus adopts a heterodox approach – a “subversive view” – making this book stand out not only from governmental economic policy-making but taking a stance far from conventional academic literature on economics. Prof. Manera is highly critical of the economic policy coming out of Berlin and Brussels, in which ultra-neoliberal orthodoxy is the predominant form of economic action. He is of the firm opinion that this wrong path will only prolong the crisis for the most vulnerable members of society and for the middle classes, which make up the economic consumer power-house of the European economy. A prime objective of the work is foster a committed viewpoint and engagement by all European nation states whereby Germany should lead Europe out of this Great Recession (rather than leading Germany only out) and that the European Central Bank should broaden substantively its objectives and concentrate on policies that support economic growth.